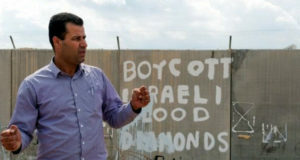 Rina Klauman, a Danish citizen from Copenhagen, and Lymor Goldstein, Israeli and formerly of Germany are still being hospitalized for their injuries from a demonstration in Bil’in village on Friday against the confiscation of 60% of Bil’in’s farmland by the separation wall and Jewish settlements. The injuries of Rina, who was beaten on the head by border police, and an Israeli lawyer, Lymor Goldstein, who was shot in the head with a plastic-coated steel bullet on Friday, are the most serious injuries the army has caused in Bil’in since Ramzi Yassin, who was shot in the head with a plastic-coated steel bullet. Ramzi, from Bil’in, was handing out water during a demonstration in Bil’in on July 8th 2005, when he was shot in the side of the head. The bullet caused severe bleeding of his brain and he was left unconscious for 7 days and with permanent brain damage. Last night Rina was transferred to Hadasa Ein Karem hospital in Jerusalem from the Hebron hospital in the West Bank for more extensive tests. They found in an MRI that she has small bleeding in her brain from a concussion she received when an Israeli border policeman beat her with his gun at the demonstration. She is not able to walk and suffers from vomiting, but is able to talk and in stable condition. It is possible that if the bleeding does not subside, however, she may need complicated surgery to drain the blood. Lymor is currently in a stable condition at Tel Hashomer hospital in Tel Aviv. 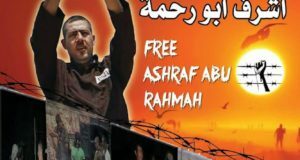 He was taken in for immediate surgery, which took 3 hours, and a rubber bullet as well as shards of bone and damaged brain tissue were removed from his head and an internal hemorrhage was stopped. It is likely that he will need several more surgeries to correct his vision, and at this point it seems the only brain damage he has incurred affects his sight. 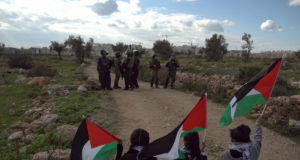 Bil’in village has held protests at least once a week since January 2005 against the separation wall that cuts through the village, and almost every week non-violent protestors are injured by the military’s violent repression of their demonstrations.